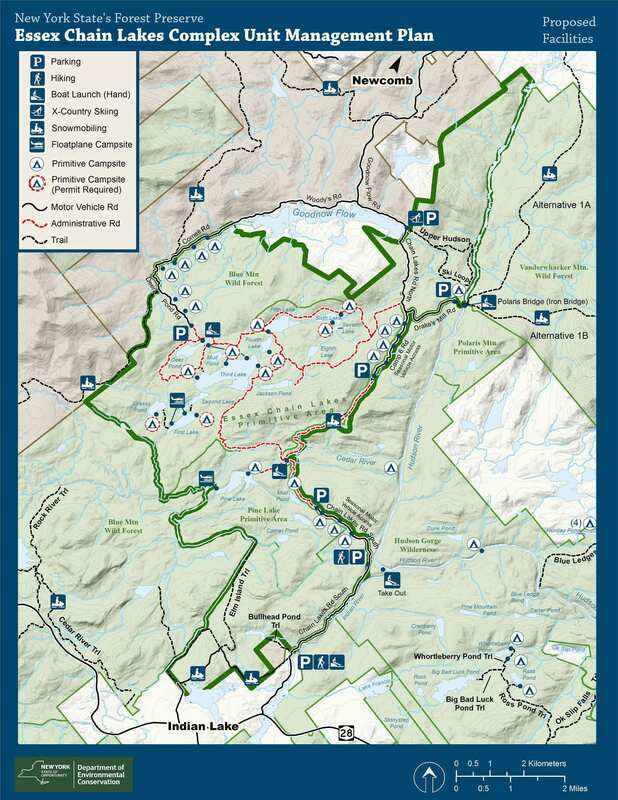 New York State has partnered with the Five Towns of the Upper Hudson Recreation Hub expected to help develop tourist destinations that rely on the extensive trail network of the Adirondack Park and existing and new lodging options. The Concept Plan for a Hut-to-Hut Destination-based Trail System for the Five Towns of Long Lake, Newcomb, Indian Lake, Minerva, and North Hudson presents 26 trail or “traverse” trips involving overnight stays and multi-day hike opportunities for visitors to the Upper Hudson region. » Continue Reading. 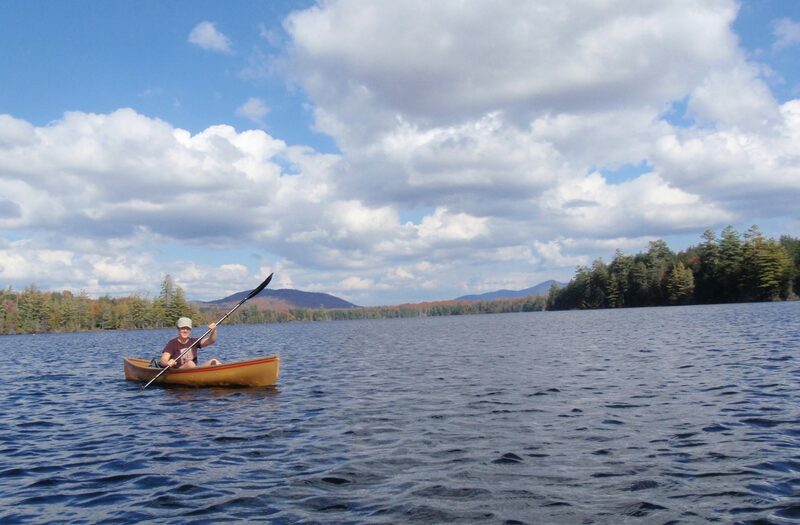 The Essex Chain Lakes and Boreas Ponds have been hogging much of the publicity over the state’s acquisition of the former Finch, Pruyn lands. 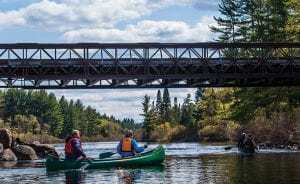 That’s understandable, for both waterways are jewels that are sure to become popular paddling and hiking destinations. Lost in all the hoopla is Pine Lake, another handsome body of water located a little south of the Essex Chain. In another time, Pine Lake by itself would have been a celebrated acquisition. I have heard from many who have gone into the Essex Chain Lakes area and encountered relatively few other people. The Department of Environmental Conservation (DEC) has stated that public use has been very high but provided no numbers. When I rode my bicycle from Newcomb to Blue Mountain Lake on a beautiful 75 degree Saturday of Labor Day weekend last year there were two cars at the Deer Pond parking lot to the Essex Chain Lakes area. This contrasted with the fairly heavy use of people hiking into OK Slip Falls, which is part of the Hudson Gorge Wilderness area. 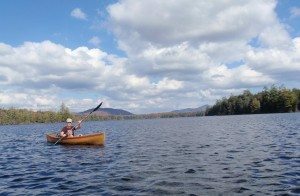 Through a freedom of Information letter, I requested trailhead logbooks from the DEC to look at the use of other flatwater canoeing locations in the Adirondack Forest Preserve – Little Tupper Lake, Low’s Lake and Lake Lila. These are all wonderful motorless areas that provide incredible flatwater canoeing and overnight opportunities. I had certainly envisioned that the Essex Chain Lakes would become another such vaunted Wilderness destination where visitors were guaranteed a wild experience, away from motor vehicles. Here’s what I found. » Continue Reading. 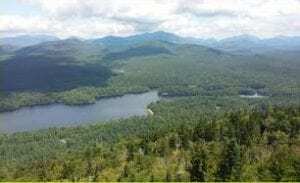 Two of the Adirondack Park’s major environmental groups are suing the state over the management plan for the Essex Chain Lakes region—a large tract of forest, ponds, and streams that the state acquired from the Nature Conservancy as part of the blockbuster Finch, Pruyn deal. Protect the Adirondacks and Adirondack Wild: Friends of the Forest Preserve filed a lawsuit in State Supreme Court in Albany contending that the management plan violates the Adirondack Park State Land Master Plan, the state Wild, Scenic, and Recreational Rivers System Act, and state snowmobile-trail policy. » Continue Reading. From green beer to corned beef and cabbage, some of the most popular St. Patrick’s Day traditions in America have little connection to Ireland. Not to downplay the importance of dressing in green, parades and brined meat, but one fun tradition that has been practiced in Ireland for hundreds of years in the counties of Cork and Armagh, is the sport of Irish Road Bowling. 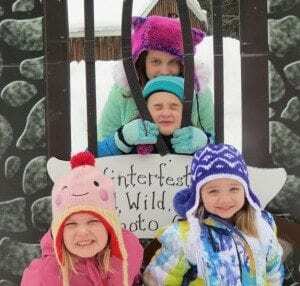 Indian Lake has been making this part of its St. Patrick’s Day tradition since 2006. 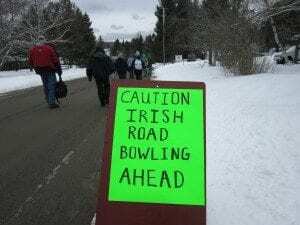 A few years ago my family decides to claim our Irish traditions, via family in Cork and being dabblers in green beer, with an afternoon of bowling in Indian Lake. We register as a family team and are handed a “bullet,” the official 28 ounce iron ball. Though it feels less like bowling and more like bocce, the energy is infectious. » Continue Reading. 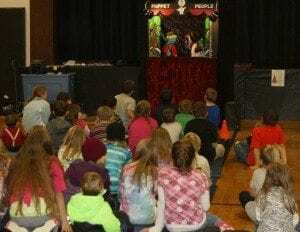 Indian Lake’s 31st Annual Winterfest – The Fabulous 50s – will take place February 12 – 14, 2016, with activities planned for the whole weekend. 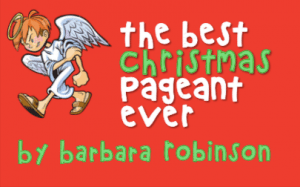 Friday afternoon will kick-off with a Winterfest Parade at 4:30 pm, featuring this year’s Queen, Jean Turner. There will be themed floats with the winners announced after the parade at the Indian Lake Restaurant & Tavern. A $50, Best Float prize will be awarded. Following the parade is the Annual Tricky Tray at Indian Lake Central School. The doors open at 6 pm. This is a benefit for the Indian Lake Central School Travel Club. Indian Lake’s Volunteer Fire Department and Auxiliary will be serving breakfast at the fire hall 7 am to 10 am on Saturday, and 7 am to 11 am on Sunday. 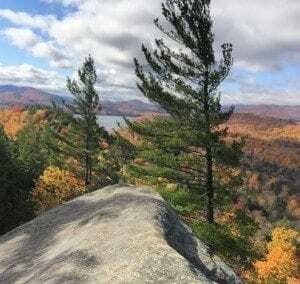 Two of the Adirondack Park’s four major environmental organizations filed a legal challenge to the Essex Chain management plan, but the two others have legal questions as well. 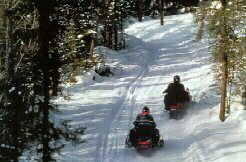 Protect the Adirondacks and Adirondack Wild filed a lawsuit today in State Supreme Court in Albany, claiming the management plan violates the Adirondack Park State Land Master Plan, the state Wild, Scenic, and Recreational Rivers Act, and state snowmobile-trail policy. 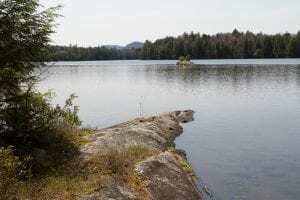 Named as defendants are the state Department of Environmental Conservation, which drafted the management plan, and the Adirondack Park Agency, which approved it. Both agencies refused to comment on the suit. Christopher Amato, a former assistant commissioner at DEC, told the Almanack that the Essex Chain plan is “blatantly illegal.” Amato is now an attorney at Earthjustice, a nonprofit organization that is representing Protect and Adirondack Wild in the lawsuit. Amato said Earthjustice will file a motion to prevent DEC from implementing the management plan until the lawsuit is resolved. Cardboard sled races will be held in conjunction with multiple winter festivals and carnivals throughout the Adirondacks during the Fourth Annual Great Adirondack Cardboard Sled Racing Circuit. 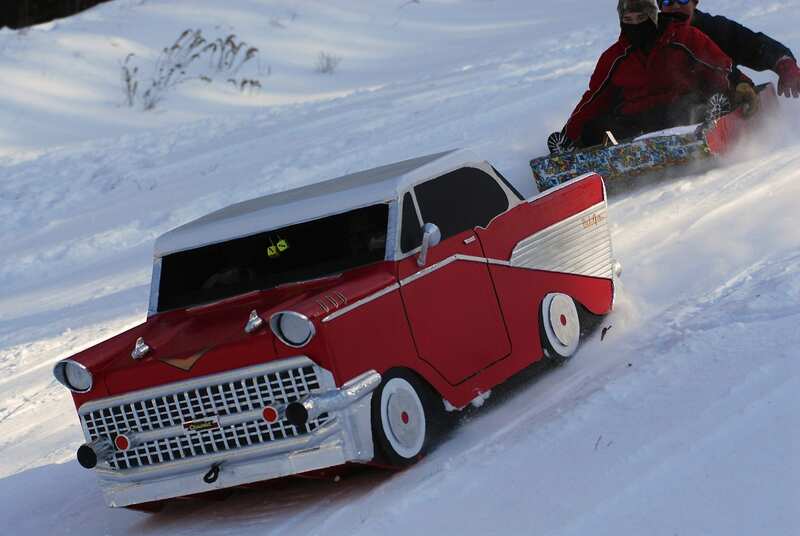 Cardboard Sled racing has grown in popularity in the last several years. The LaPorte Family of Eagle Bay has won the Circuit’s Grand Prize for the last two years, usurping Bob Lewin’s win in Daddy’s Folly in 2013. The LaPorte’s designs have included two army trucks and 2015 they introduced a classic Red Chevy with a functioning trunk allowing room for a hidden rider. The LaPorte’s have been a tough team to beat. » Continue Reading. There is more to the Adirondacks than being on a mountain, though that is certainly one way my family plans on spending the holidays. We also look forward to relaxing together during a classic Christmas performance. It sounds corny, but with our kids being pulled in one direction for school sports and my husband and I going in another direction for work, we find it best to meet somewhere in the middle. Thankfully there are plenty of wonderful theatre performances around the Adirondacks that will help us get into the holiday spirit. » Continue Reading. The Wildlife Conservation Society (WCS) has announced the route for Cycle Adirondacks — a week-long road bike tour through the Adirondack Park scheduled to take place August 20–27, 2016. This will be the tour’s second year; registration is now open. 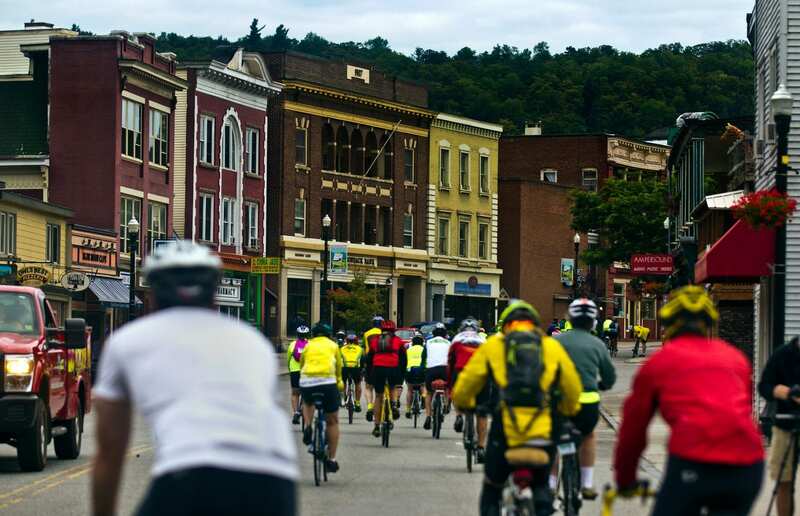 The 2016 route starts and ends in Hadley-Lake Luzerne, NY, and includes overnight stops in Ticonderoga, Keeseville, Saranac Lake, Indian Lake and Northville. There will be a “layover day” in Saranac Lake where riders can pedal an optional route that tours Lake Placid or take a day off the bike to enjoy the amenities available in the Olympic Region. » Continue Reading. Since my children’s Christmas lists consist mostly of electronic devices made in Asia, I understand the appeal of Black Friday. I’m being realistic in knowing that going completely Internet free isn’t going to happen, but it doesn’t mean that I can’t balance the electronic waves with some handmade Adirondack goods and services. Theatre tickets and museum memberships are always a go-to favorite, but we also look for those “made in the Adirondacks” products that come from the talented artists and crafts people that make the Adirondacks their home. One place to make a local Black Friday and Small Business Saturday count is the 18th Annual Indian Lake Country Christmas Tour November 27-28. » Continue Reading. Note: This article is the second of three that looks at the widespread violations of public process, state policies, and state laws in the recent approval of the Essex Chain Plan. Part one can be found here. 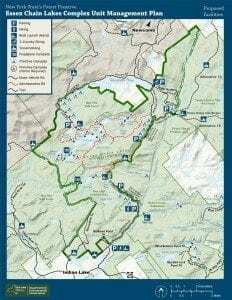 One of the most controversial elements of the Essex Chain Complex Unit Management Plan (Essex Chain Plan), approved last week by the Adirondack Park Agency (APA), is the proposal to cut a new five-mile snowmobile trail through the western part of the Vanderwhacker Mountain Wild Forest area, east of the Hudson River. This new snowmobile trail will retain and use the Polaris Bridge and is designed to connect the communities of Indian Lake and Minerva with a major new snowmobile trail, despite the fact that these communities are already connected with a major snowmobile trail. The 1.6-mile Watch Hill Trail has been newly designated, signed and marked. The trail is located in the Jessup River Wild Forest off State Route 30 between the Hamilton County communities of Speculator and Indian Lake. The trailhead is located on the east side of State Route 30 near Griffin Brook approximately 1 mile south of the Snowy Mountain Trailhead. » Continue Reading. The Adirondack Park Agency (APA) is accepting public comments on how their Essex Chain Lakes Complex Plan conforms to the Adirondack Park State Land Master Plan. The comment period will conclude on October 16, 2015. The plan addresses the continued development of controversial bicycling and snowmobiling projects, including the construction of a bridge over the Cedar River continued maintenance of the Polaris (Iron) Bridge over the Hudson River, and the construction of a new snowmobile trail between Indian Lake and Minerva. » Continue Reading. There are several creatures that serve as symbols of the rugged and majestic character of the Great North Woods, yet none is as fitting as the moose. At first sight, a moose may seem quite ugly and an unusual choice to represent the beauty of the northern wilderness. Its disproportionately long legs, awkward gait, protruding hump on its back above its shoulders, rather rough coat and odd looking facial features may not be very appealing. Yet, together these characteristics create a unique and overwhelming image to those lucky enough to see one of these giants in the wilds, and they help this massive mammal flourish in a sub-arctic region. » Continue Reading.